Nodding Catchfly is an attractive, persisting garden plant readily recognized by its beautiful pink flowers, straggling leafy stems, racemelike inflorescences with axillary flowers, and the obovoid, papery, strongly veined sepal cup that is constricted below the middle. Pink obovate petals are divided into two diverging lobes at the tip. Sepal cup is prominently 10-veined, obovoid, especially in fruit, club-shaped, constricted around carpophore and narrowed at mouth, inflated, 1.3-1.8 cm. 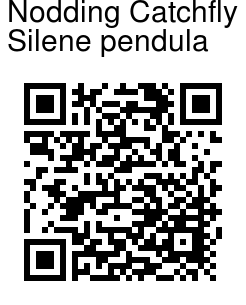 Leaves are 2 per node; proximal with blade obovate, spoon-shaped, blunt- tipped; distal one stalkless, blade ovate to lanceshaped, 2-5 cm × 2-20 mm, pointed-tipped. 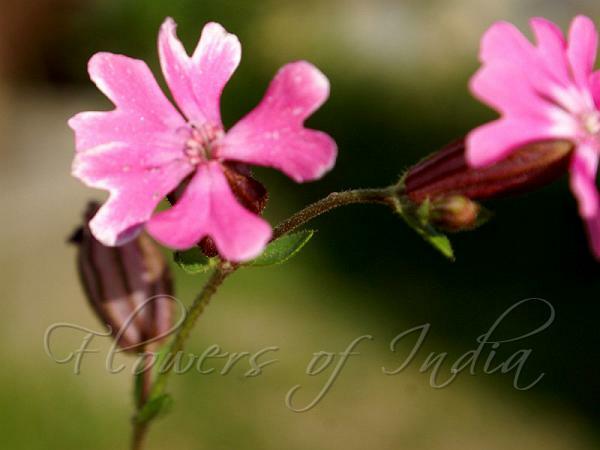 Nodding Catchfly is native to Italy, cultivated in Kashmir.